HomeNewsCommunity BuildingFrom the new LATAM network for spina bifida and hydrocephalus: Genetic factors and social inclusion are fundamental worldwide! 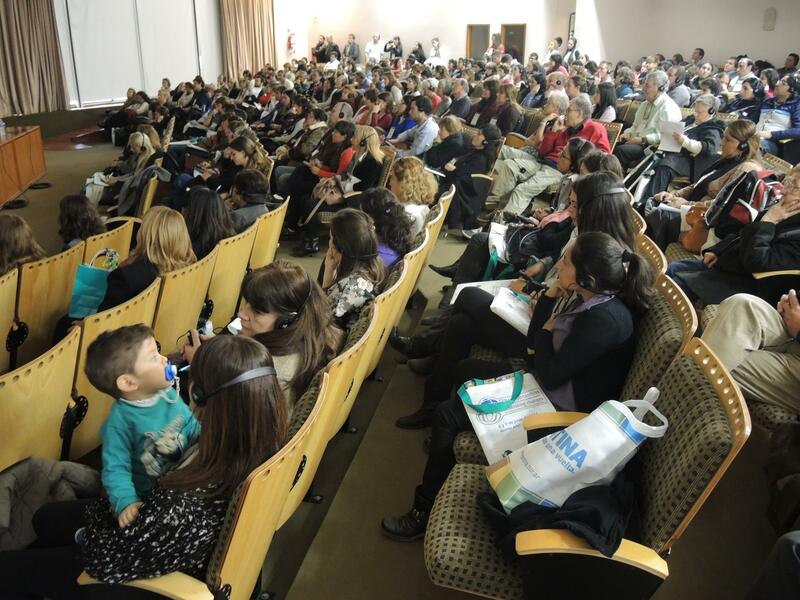 6-7 June 2014 // During the last two days Buenos Aires was filled with discussions on key topics for the Spina Bifida and Hydrocephalus (SBH) global community. Genetic factors of SBH, social inclusion, and the right to health were at the top of the agenda. Around 400 participants attended IF’s 25th International Spina Bifida & Hydrocephalus Congress: “GENErating Changes” and more than 200 people followed online. IF’s global network has been enlarged by welcoming six new organisations. Approximately 300.000 people worldwide are born with Neural Tube Defects (NTDs) like Spina Bifida. Being one of the preventable health conditions, it still affects approximately 1 in every 1000 pregnancies a year. Bearing in mind the importance of folic acid in NTD prevention as well as advancements in foetal surgery, neurosurgery, urology, and neuro-orthopaedics, IF’s congress aimed at refocusing on genetic factors as well as outlining and analysing factors that facilitate or hinder the full social inclusion of young persons and adults with SBH. Invited experts analysed several issues ranging from scientific breakthroughs to social inclusion, education, access to healthcare, adaptive sports, and labour market insertion. “The IF Annual Conference arranged by APEBI in Argentina has had something for everyone: a wonderful opening ceremony with young representatives carrying flags, a police band and a tango concert. The session on the medical aspects of SBH have been very interesting, giving the recent updates on the situation regarding foetal surgery around the world. There have been many presentations on how to achieve social inclusion and tackling the barriers to the full involvement of people with disabilities in society. The participants have also been reminded of the importance of folic acid and the need for both supplementation and fortification. Young people with SBH had the opportunity to discuss their life experiences and issues such as sexuality and employment. All in all, a very successful conference! ” said Margo Whiteford, IF President. APEBI, the Argentinian Association for Spina Bifida, has recently initiated the creation of the LATAM Network on Spina Bifida and Hydrocephalus. It seeks to gather together representatives and organizations of SBH from the region to carry out research, disseminate and share information, foster education and strengthen the programs and actions designed at improving the life of persons with SB and their families. Read more on the APEBI website. The IF Award 2014 was given to a paediatric surgeon Dr. Santiago Portillo as an appreciation of his professional expertise and remarkable achievements in the treatment of SBH and his personal commitment and dedication to his daily work. “The positive value of the international congresses like today’s is undoubtful. It was well attended by the Latin American associations’ representatives, families, doctors, and international experts. It shows the importance of addressing topics so common to the international audience. Spina bifida is the second cause of child mortality in Argentina. We are doing our best to enhance the visibility of spina bifida and hydrocephalus globally within the medical community, government, civil society and private sector in order to influence policy makers to assure better quality of healthcare services worldwide” stated Lieven Bauwens, IF Secretary General.